The History of Kunz Engineering Inc.
Kunz Engineering was founded in 1992 by owner Gary Kunz. To fully understand how Kunz Engineering was founded, we need to go back a few years. It all began when Gary Kunz volunteered to mow the 4-1/2 acre Mendota Bible Church lawn. This turned out to be a bigger job than expected but Gary was up to the challenge. For a number of years prior to this, Gary had been pulling a single 20″ walk-behind push mower off to the left hand side of a 32″ riding mower. This concept helped to drastically reduce mowing time. For the church yard he decided a second 20″ push mower was needed on the right hand side. He used this set-up for roughly one season and then decided that adding two more 20″ push mowers on the front of the riding mower would further reduce his mowing time. This required a special front hitch extending to both sides of the riding mower and set up to produce the proper overlap. It was quite a sight to see a small riding mower surrounded by four 20″ push mowers. It was rather loud as well having five individual engines running at the same time. Keeping everything running properly and turning without 20″ push mower rollovers was a whole other challenge. This system was used through the 1986 mowing season. During the 1986 mowing season Gary had the opportunity to use a push style mower on the front of an ATV. He found this set-up was hard to steer and very hard to control on side hills. It was at this point that he decided to make a pull behind mower similar to the ATV push mower but using the same concept as his current rig. 1987-1991 In the winter of 1986/1987, Gary designed his first 48″ pull behind mower. With his engineering background, Gary was quite accustomed to developing new products so this was natural for him. To the amazement of Gary, his new 48″ pull behind mower was very easy to pull and maneuver around objects. In fact it worked so well, he decided to make his first 60″ pull behind mower the following winter. In the fall of 1991 Gary designed another 60″ pull behind mower improving on the last design and including certain safety features. Shown from left to right. Gary’s first 60″ pull behind mower (light gray) built during the winter of 1987/1988, Gary’s third 60″ pull behind mower (dark gray) design built during the fall of 1991, Gary’s first 48″ pull behind mower (green) built during the winter of 1986/1987. Each version was designed slightly different to incorporate new concepts. 1992-1993 In the spring of 1992 Gary was laid off from his engineering job. Having three kids in high school and not desiring to move Gary decided to turn his hobby into a business. During the spring of 1992, Gary developed his fourth pull behind mower design. This new design incorporated all new parts with manufacturing and marketing in mind. After a great deal of testing and demonstrating the product concept to potential customers, Gary felt it was time to produce and sell this product. 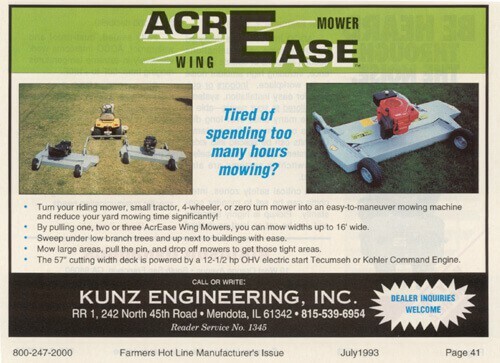 In 1993 the AcrEase (pronounced acre ease) brand of wing mowers was born. The AcrEase was introduced with two different 60″ models. One of which had a 12.5 HP Kohler engine (Model 3700) and the other outfitted with a 12.5 HP Tecumseh engine (Model 3701). A great deal of time was spent during the 1993 mowing season traveling around and demonstrating the product. It still amazes Gary how many customers were so impressed with the product, that they were willing to purchase the mower right off of the trailer and from a brand new company. To this day the majority of these original mowers are still running and a number of them have more than 3000 hours of use. The original models were considered to be homeowner quality, and Gary saw a need for a commercial grade mower. This was one of the first magazine ads showing the AcrEase Wing Mowers. This particular ad was run in the July 1993 issue of Farmers Hotline Magazine. The picture on the left side shows the actual prototype mowers that were built in 1992. The picture on the right shows a 1993 AcrEase Model 3700 Wing Mower. 1994-1998 In 1994 Gary developed his first 60″ commercial grade pull behind mower. Two prototypes were built and extensively tested during the 1994 season. One of the prototypes was equipped with a 14 HP Kohler engine and the other prototype had a 14 HP Kawasaki engine. 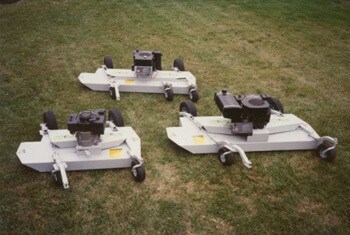 The commercial mower worked well and in 1995 a pre-production run of commercial models were built and sold. This particular model is still in production to this day, and it is known as the Model C60K (14-18 HP Kohler Command Engine). Several of these models are known to have over 5000 hours of use on them. After talking with a number of customers and hearing quite a few requests for a smaller version, Gary decided to develop a new model in the 40″ size range. A prototype 40″ model was built and tested in 1995. In 1996 a pre-production run of 40″ mowers were built and sold as the Model H40B (8 HP Briggs & Stratton Engine). Also in 1996 the original Model 3700 and 3701 were redesigned and updated with several features similar to the C60K. The engine was relocated, and a new belt drive system was used. The original design placed the engine directly over the center blade. Under some abusive circumstances, the engine was somewhat vulnerable to impact loads from the blade. A large 3-3/4 gallon gas tank was also added in place of the original 1 gallon gas tank. This allowed the operator to run roughly 4 hours instead of a little over 1 hour. Both of these models went to production in 1997 and were known as the Model H60K (12.5 HP Kohler Command Engine) and H60T (12.5-13 HP Tecumseh Engine). Up until the late 1990’s the majority of AcrEase mowers were pulled off to the side of riding mowers to reduce mowing time. In the late 1990’s, there was a growing trend to use ATV’s for mowing. During this time period, Kunz Engineering saw a drastic shift in sales towards the ATV market and adjusted their marketing strategies accordingly. The 1996 line up. The mower on the left is the Model H40B, the mower in the center is the Model 3700 with the Floatation Kit attached and the mower on the right is the Model C60K. 1999-2000 In the spring of 1999 Gary’s son Matt graduated from college with a degree in mechanical engineering and joined Kunz Engineering full time. Matt had worked with the company from the very beginning but would now play a much bigger role in new product development. Matt’s first project was to finish up a design on a new type of mower. Gary started the preliminary layout on this new mower design 4 years prior but didn’t have time to do the final touches. The original idea for this new mower came from Gary’s experiences out in Kansas and Nebraska. The current finish mowers were not quite right and a full blown brush cutter was not needed but more of a “modified” rough cut mower. Gary and Matt worked very closely during the 1999 season testing and developing the new “modified” rough cut mower. Many hours were put into the design before a final prototype was developed. The ability of this new prototype surprised both Gary and Matt. It not only worked great on the in-between conditions, but it was an excellent brush cutter as well. It had the ability to handle up to 2″ diameter saplings and tackle 5-6 foot tall grass and leave the area almost looking finish cut after a second pass. In 2000 a pre-production run of the new rough cut mower was built and known as the MR55T (17 HP Tecumseh engine). All of these original rough cut mowers are believed to still be in use, a number of which have well over 1000 hours of use. Gary also saw a need to create a less expensive model of 60″ finish mower. A model was developed without many of the frills and was originally classified as the economy model. This configuration was made available in 2000 and was known as the Model E60B (12-13 HP Briggs & Stratton Engine). 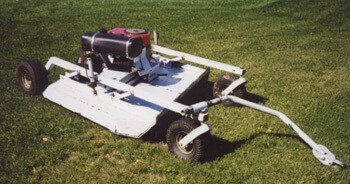 Pictured above is the original prototype AcrEase rough cut mower built in 1999. This particular prototype saw a number of revisions and was released in the year 2000 as the Model MR55T rough cut mower. 2001-2002 In 2001 when the Model MR55T pull behind rough cut mower went to full production status it was a hit. During this year the MR55T sold five times the forecasted number of units for the year. Customers were amazed with its ability to handle the seemingly impossible tasks. During the 2001 mowing season, it became apparent that a rough cut mower with a larger engine was needed. In 2002 the model MR55K (20 HP Kohler Command engine) was born. During the 2001 season, a few issues arose with the Tecumseh engine on the Model MR55T and Kunz Engineering felt the only option was to replace it. In 2002 the Model MR55T with the 17 HP Tecumseh engine was replaced with a 17 HP Briggs & Stratton engine and was renamed the Model MR55B. 2003-2004 With Gary having an agricultural engineering degree and a master’s degree in soil dynamics he always had a desire to expand into the development of tillage equipment. Over the years both Gary and Matt had talked with a number of customers that had been looking for a good piece of tillage equipment for their ATV. The biggest complaint was that the current ATV tillage equipment on the market didn’t perform up to their expectations. 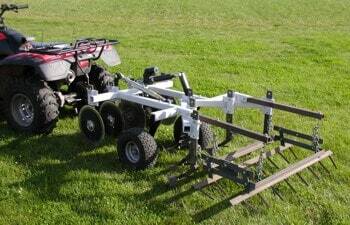 In the fall of 2003 Gary and Matt started playing with different ideas for ATV tillage equipment. Their goal was to develop a tillage tool that was extremely aggressive yet easy to pull with an ATV. They knew right away that it would have to be some form of a chisel plow with rigid shanks if it was going to work properly. After a great deal of trial and error and applying some fundamental soil dynamics theory, an original prototype was designed and built. Throughout the 2004 season a number of additional changes were made to the prototype, and a number of demonstrations were done for potential customers. Onlookers were amazed by the ability of a small ATV to do so much groundwork in such a short period of time. At that time Kunz Engineering was only using a 4×4 350cc ATV to prove out the design. Their thought was that if a 350cc ATV can pull this tool then a bigger ATV would work great. Also in 2003 the Model H60H (13 HP Honda engine) was released after a request was made for a Honda version of the AcrEase finish cut mowers. The majority of these H60H models were made up in a red paint scheme as a marketing test. In 2004 the Model C60H (13 HP Honda engine) commercial finish cut mower and Model MR55H (18 HP Honda engine) rough cut mower was released. These particular models allowed Kunz Engineering to enter a different segment of the market. 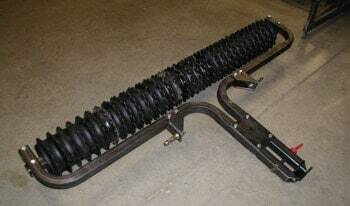 Pictured above is the original prototype Till-Ease Model 543 and a very crude version of the optional drag harrow. This prototype was built in the fall of 2003 and went through many revisions before finally going to production in 2005. 2005-2006 In 2005 a pre-production run of the new tillage tool was built. For this new line of equipment, a new product name was needed as well. Kunz Engineering decided on the name Till-Ease to follow along with the AcrEase name. The new tillage tool was called the Model 543 Chisel Plow / Field Cultivator. In 2005 , after several years of testing, Kunz Engineering also released the Model MR55KE (20 HP Kohler Command engine) pull behind rough cut mower. This particular model used an electric clutch for blade engagement instead of the current manual clutch engagement. The electric clutch was used because of its ability to increase the life of the drive belt. Kunz Engineering had also been seeking different ways to improve upon the current Model C60K commercial finish cut mower. In 2005 a prototype finish mower was created which incorporated several features that had been tested for a couple of years prior. This new finish mower featured larger tires, a larger engine, an electric clutch for blade engagement and also a fast way to change the cutting height. 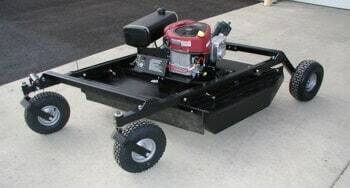 In 2006 the prototype finish mower became a reality when a pre-production quantity was released and named the Model Pro60K (18 HP Kohler Command engine). The “Pro” name was adopted to signify the upgrade over the commercial model. Also in 2006 the Model MR55B rough cut mower was upgraded to a new 22 HP Briggs & Stratton engine and a new Model H60B (13 HP Briggs & Stratton engine) finish cut mower was created. After hearing of a need for a good pull behind cultipacker in the market place, Kunz Engineering developed and released the Till-Ease Model 2148 Cultipacker as well in 2006. Pictured above is the original prototype of the AcrEase 44″ rough cut mower. The 44″ rough cut mowers were released in 2008 under the model names MR44B and MR44K. 2007-2008 Years before when Kunz Engineering was developing the 57″ rough cut mower, Kunz Engineering had the opportunity to do some test work at a Wisconsin Christmas tree farm. With the tight spacing between the trees, it was obvious that a narrower rough cut mower was going to have to be developed sometime in the future. 8 years later that became a reality when Kunz Engineering decided to develop a scaled-down version of the 57″ rough cut mower. A variety of sizes were tossed around but the 44″ size was eventually settled on. In 2008 the Models MR44B (17.5HP Briggs & Stratton) and MR44K (18HP Kohler) were released for full production. The new 44″ size rough cut mower was an instant hit. Customers liked the fact that the new design was just as rugged and performance oriented as the larger size but in a compact form. Also in 2008, the longstanding Model H60T was dropped. Sales of the H60T had basically come to a halt due to the more popular Model H60B that was started in 2006. The Models H60B and MR55B were also outfitted with larger engines in 2008. The Model H60B bumped up to a 17.5HP engine and the Model MR55B bumped up to a 23HP engine. Pictured above is the original prototype Till-Ease Model TP3272 cultipacker. This model was released in 2010. 2009-Present Many of the AcrEase finish cut mowers that Kunz Engineering builds are used as wing mowers off to the side of riding mowers and zero turn mowers. Over the years there has been a general trend by the commercial duty zero turn manufacturers to increase horsepower. Kunz Engineering felt that they needed to address this by coming out with a higher horsepower wing mower. After doing testing during the 2009 season Kunz Engineering settled on the 23HP Vanguard engine mounted to a Pro model. The new high horsepower Pro model had the ability to keep up with large horsepower zero turn mowers in heavier than normal finish cut conditions. This model was a beast. In July of 2010 this new model was released and called the Pro60V. In 2009, Kunz Engineering also felt that it was time to expand the Till-Ease cultipacker line. In the past years there had been quite a bit of request for a larger size pull type cultipacker and also a unit that could be mounted to the 3-point on a tractor. Knowing that, Kunz Engineering thought it would be a great idea to build a larger all-in-one unit. In 2010 the Till-Ease Model TP3272 was released. This model is a 72″ wide unit that can be mounted to either a tractor or pulled with an ATV/UTV. In 2011 the Till-Ease Model TP2148 was also released. This model is just like the TP3272 but only 48″ wide. The tubular design of the TP models helped to reduce the cost and increased the strength. Since the company first began, Kunz Engineering has strived to be the leader in innovation with any piece of equipment they have developed. Kunz Engineering has made its mark, creating some of the highest quality pull behind equipment for lawn and property maintenance.